show do not show the internal details of menu items in the Add-ons Manager. In the previous build I could inspect anything in the list items. Thanks Paenglab, I'll try in a different profile later and see if it happens there. 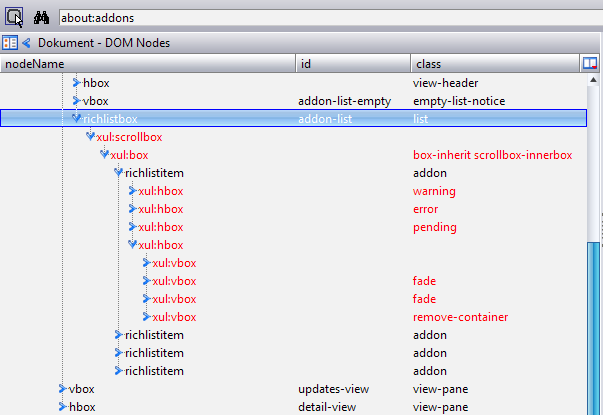 Notice the add-ons no longer appear in the list-box and the DOM tree just dead ends. I've seen this behavior before with different parts of the UI, but in Beta 4, I can still inspect this panel! Yeah, they aren't finished with messing with the layout. It's a bugger, Patrick. You might want to wait until they arrive at their destination before trying to rework it so your time and effort doesn't go down the drain. I'm not inspecting the Window, I'm inspecting the Content Document. As you can see in the image, the list-box is appearing empty, for some reason it's not even loading into DOMi. This is really quite bizarre. I'm not inspecting the Window, I'm inspecting the Content Document. 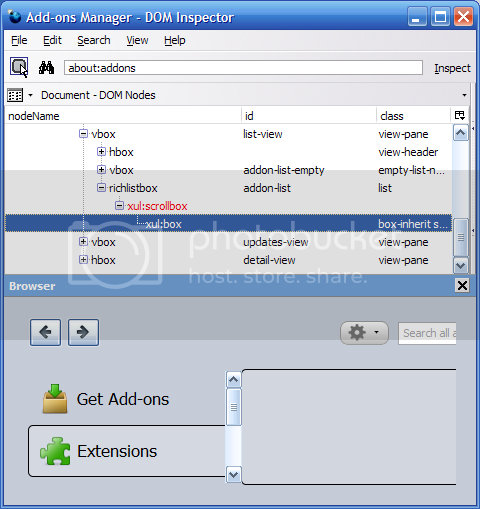 I'm using DOM Inspector... I can't use the built-in Inspector, it's completely baffling to me with all of it's popups and mouseover frantic craziness. Ahh, I'm not sure what you mean. I can't use the Inspect button, I'm opening the DOM tree by clicking on the expanders, but as you can see in the pic the DOM tree itself just dead ends. Where is says "xul:box" there should be another expander and all of the DOM for each addon item. P.S. - Ahh... And don't inspect the content... Try inspecting the chrome. Ahhh I get you now, I'll try later when I'm home. I forgot DOMi can be used in that way! But I'm pretty use the AOM does load as Content instead of Chrome... it's weird. The barrier isn't your English, it's my brain. If you install that then put its toolbarbutton in your toolbar, then make sure Add-ons Manager is open in some tab, then you can just click the Inspector Widget toolbar button then click anywhere in the Add-ons Manager and you should then be inspecting it with everything revealed.